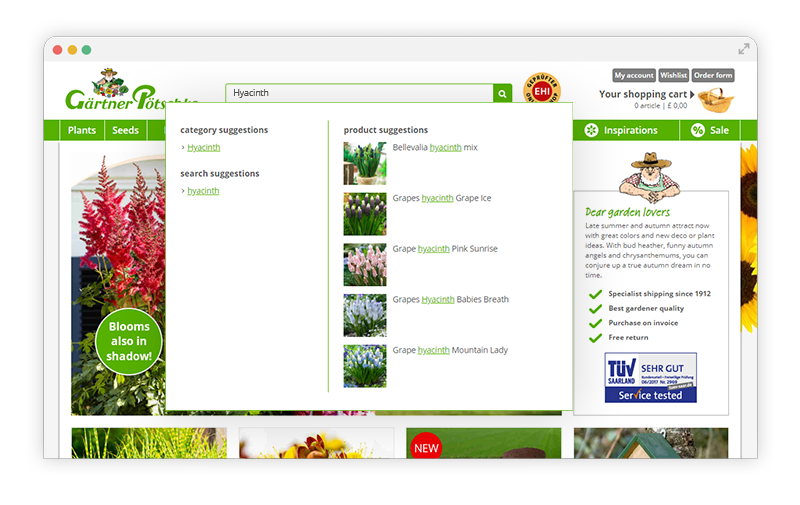 The diversified online assortment offered by Gärtner Pötschke includes nearly 10,000 different articles – from seeds, plants and flowers to tools and greenhouses. It provides everything that amateur gardeners need – assuming that they can find what they are looking for. That may sound trivial but it represents a serious challenge, as Tobias Schwering, head of e-commerce at Gärtner Pötschke, can confirm: “Thousands visit our shop on a daily basis and they all have their own shopping behaviour. For example, some of them just enter short keywords such as geranium in the search and then filter, while others enter complex queries like red geranium xl hardy. Others are just looking for inspiration and like to browse in our categories or advisory contents. We recognised at an early stage that our shop software did not allow us to meet all customer requirements. That is why we are implementing FACT-Finder as a supplementary solution to optimise what happens between the landing page and checkout. Our sales figures and the prize we won recently both prove that this measure is bearing fruit. We are benefiting from the decisive advantage that FACT-Finder provides with regard to the convenience, user experience and assortment criteria. After entering the first letters in the search field on poetschke.de, shoppers are presented with a concise menu of search, category and product proposals. “Many of our customers are knowledgeable and already know what should end up in the shopping cart when they get started. Unlike Amazon & co., our suggest menu shows concrete products with photos that lead directly to the relevant detail pages. This saves each customer one step in the purchase process, as no results list is required,” says Tobias Schwering. Orientation made easy: The suggest menu on poetschke.de shows suitable categories and products alongside search proposals. Even if customers make a typing error. 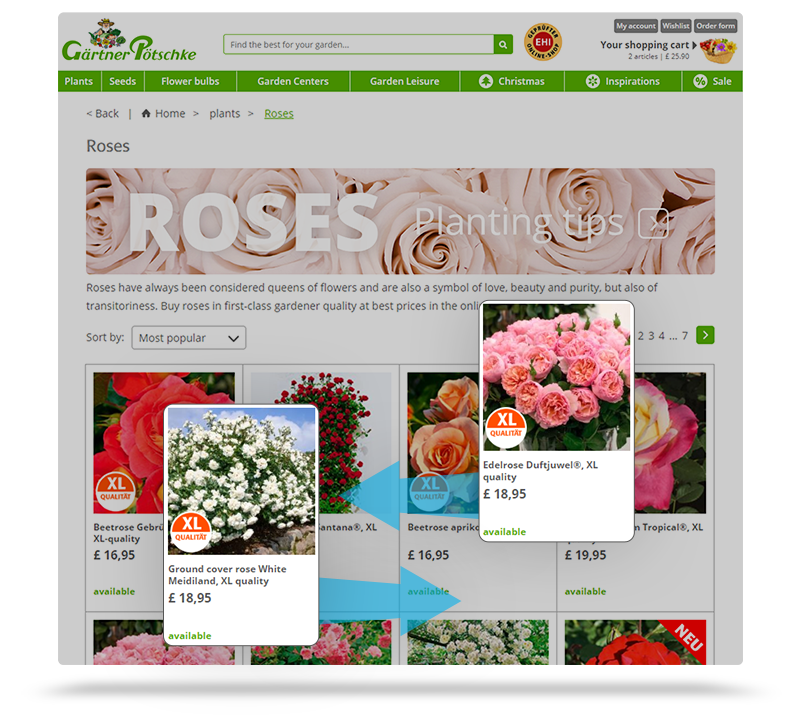 “Rose”, “geranium”, “fertiliser” – the majority of Gärtner Pötschke’s customers start shopping by searching for a generic query. The difficulty is that the result list is often confusing, as too many products match the term entered. The e-commerce team therefore focuses on filter navigation in shop optimisation: “In addition to the search, the filters are definitely the most important tool for customers. FACT-Finder helps us to control the precise sequence we use to display our filters – text, tiles or sliders – and which filters are dependent on one another. The practical advantage of FACT-Finder is that it uses the search result to generate the filters. Filters that would not lead to any result are excluded,” explains Tobias Schwering. The rules are the same in retails stores and online shops: Customers prefer to buy what they notice first – if they make a purchase at all. The sequence in which products appear in the result list has a major effect on revenue. Gärtner Pötschke leaves nothing to chance regarding the sorting of search result and category pages, combining machine learning functions with their own rules: “We really appreciate the fact that FACT-Finder provides us with so many opportunities to improve the result listing. FACT-Finder learns which products are clicked on and purchased most often and continually improves sorting without any input from us. In addition to this automatic optimisation, we use rule-based logic to position high-margin or discounted products more prominently – at our discretion. The personalisation function takes over the fine-tuning, adjusting the result listing to the previous shopping behaviour of the individual customer. Ultimately, FACT-Finder allows us to take many factors into account for sorting. 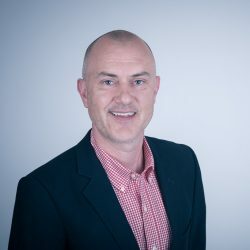 It is useful for us to be able to understand why a product is in a particular position – FACT-Finder is certainly not just a black box,” says Tobias Schwering. A customer placed pink-coloured products in the shopping cart during a shop visit. If this customer now searches for “rose”, FACT-Finder adjusts the sorting for this colour preference. Instead of using the search, many online shoppers navigate to find what they are looking for. This includes those who do not know exactly what they want, or who need more information to make a decision. These customers can also quickly achieve this aim with Gärtner Pötschke – thanks to topic-related category pages and easy-to-find advisory contents. “In addition to existing categories, FACT-Finder can also be used to implement categories that are not defined in the product data feed. 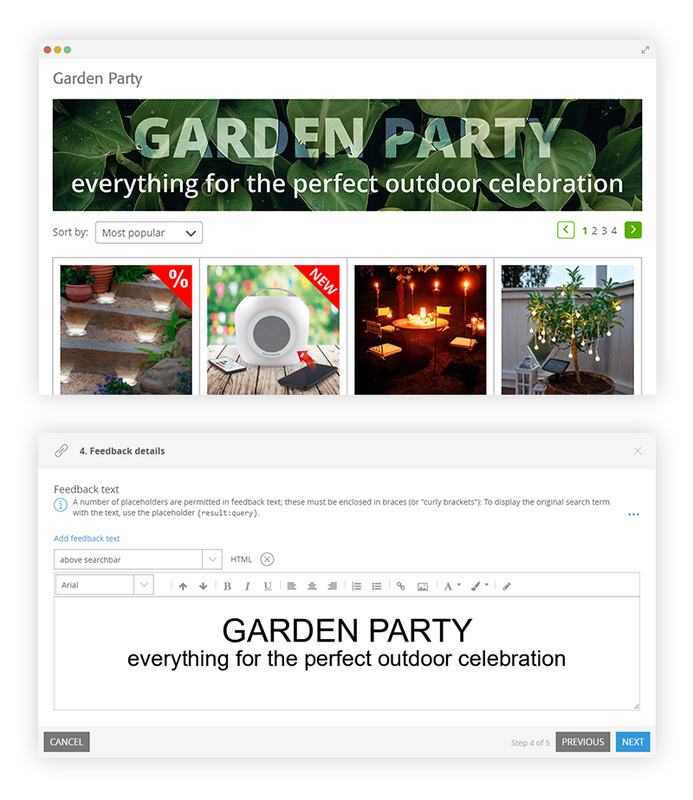 This makes it easy for marketing teams to realise inspirational shop pages on specific topics – garden parties, balcony design or a dream lawn – and use rule-based logic to provide them with suitable products,” recommends Stefanie Maier. More cross-selling with inspirational topic pages: It is quick and easy to implement current marketing requirements in the FACT-Finder backend. 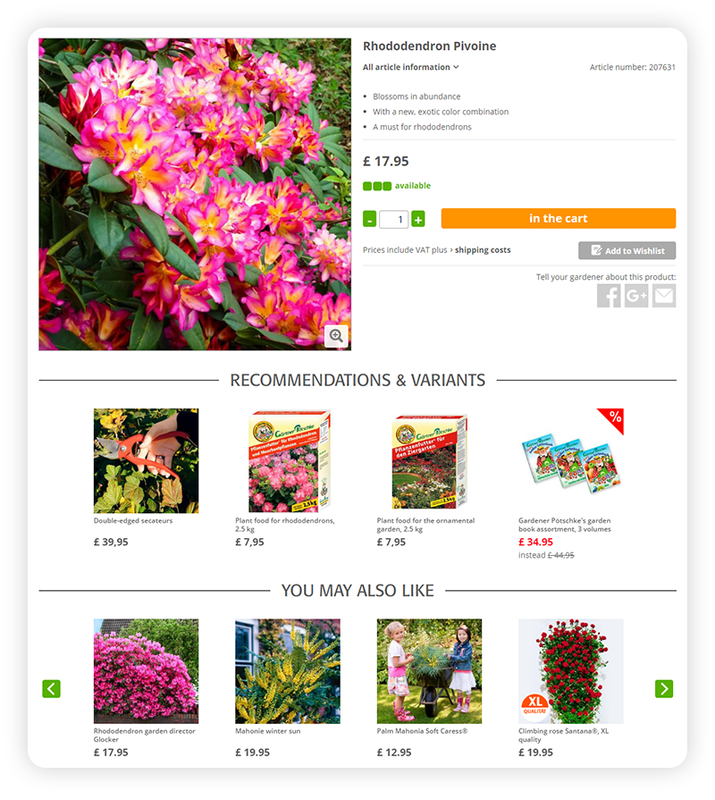 Personalised alternative and complementary recommendations on the detail page for a rhododendron product. Customers do not need to start another search to find the right accessories. Previous Post Amazon vs. Alibaba: Who wins the battle of the platform giants?